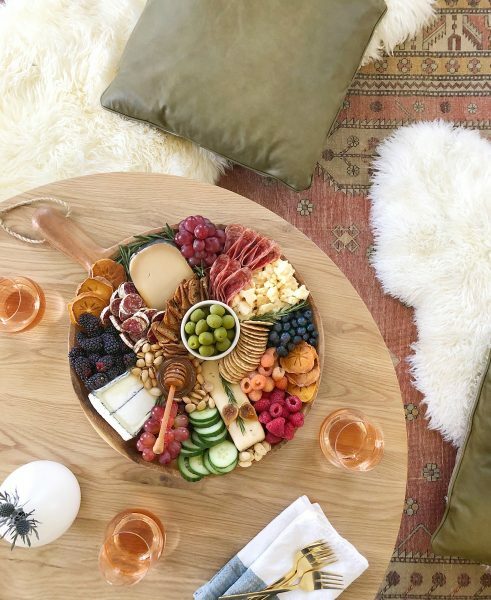 For our Easy Entertaining series, we’ve partnered with some of our favorite, food-forward influencers to learn how they throw a party and keep their cool. For this round, we sat down (actually we called her) with prop and food stylist Meg Quinn (@ainttooproudtomeg). 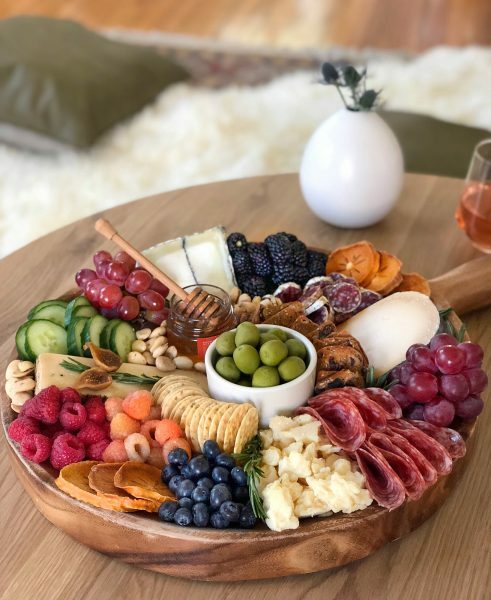 Best known for her gorgeous and delicious charcuterie boards, we asked Meg what goes into making one, and about her personal entertaining philosophy. One of Meg’s beautiful charcuterie boards, styled alongside our Belez pillows in olive green, and our Lanna sheepskin throws. Like her Amoeba coffee table? It’s available in walnut! Hi Meg! Thanks for taking the time to chat with us about how you like to entertain. First off, can you tell us a bit about yourself? Your “origin story,” as it were? Yes, for sure! While I’m L.A. born-and-bred, I love to travel. I studied abroad for some time, but always returned home to be near my family. I went to University of Southern California for school, and after graduating fell into an entertainment marketing. For that job I worked to place products in TV shows, and that eventually evolved into a straight advertising role where I produced commercials. I did that for 13 years! While I was working, I was always dabbling in other passions on the side, like interior design and hosting. I left the agency last year, and have been focussing on my styling and design every since. How did you get into doing food styling? The cheeseboards! They got such a great response on Instagram, and that, paired with my contacts in film and advertising, organically turned into a food stylist role. Most of my work is for commercials and Instagram content shoots. It’s fun — I never thought I would be in the food world, even though food has always been a big part of my life. My mom was in the catering business. When I was a teenager I would go with my mom to her catering jobs. She always had these little tricks to make the dishes look better. More fun, more appetizing. When I think about it, I realize I got my food interest from her. When I was in my twenties my mom would come and help me set up parties for my friends. She’d cut up lemon wedges and garnish the tub of hummus with an herb. At the time I didn’t think much about it — my friends and I were busy drinking — but now I use tricks I learned from her all the time. Things like putting a sprig of rosemary on cheese wheels, or making sure to contain a soft crumbly cheese in a ramekin. Meg likes her boards to include decadent and healthy options. Cheese AND raspberries; chocolate AND almonds. It’s about balance people. How does food styling relate to your entertaining style? For me, everything comes down to presentation. In spite of being in the food world, I’m not a big cook. Easy entertaining is really important to me. I love elegance and delicious food, but I don’t want to stress myself out. Instead, I choose beautiful prepared things and present them with care. For me, it’s not about being extravagant in the kitchen. It’s about the details that elevate the offering. Could you tell us what a typical Meg Quinn party might look like? Sure! My girlfriends and I get together once every two months or so. We used to go to a restaurant, but we found that sitting around the table didn’t allow us all to catch-up with each other. We’d just talk to whoever was directly across from us. So we switched to a roving host. 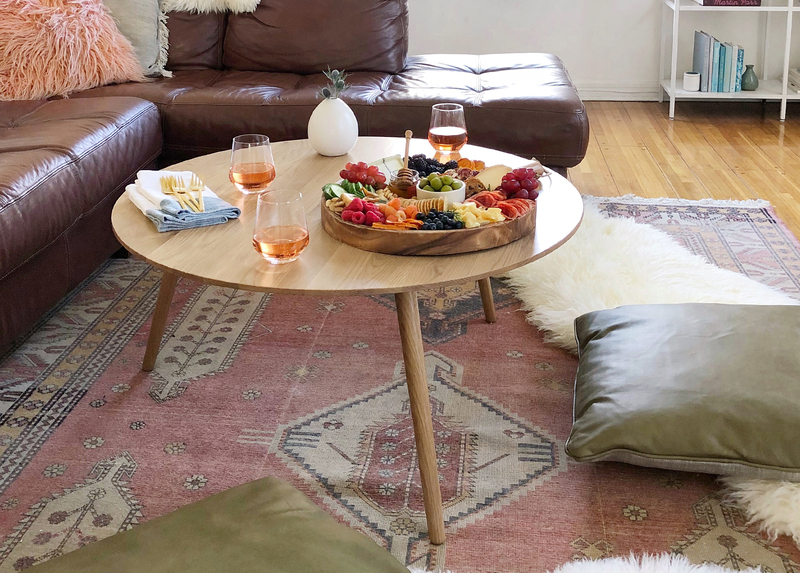 It’s very laid back: we load up the coffee table with spreads, chips, wine, and probably a cheeseboard. Like I said: I’m not a big cook. I’d rather round out a board with a bunch of different elements than worry about a lot of different dishes. Maybe like, some chocolate-dipped strawberries, or popcorn. And of course, I always garnish with something unexpected to elevate the feeling, like chamomile flowers. Even if we order in, I’ll always transfer the food to some platters and make sure to add some special, thoughtful touches. Can you give us your top tips for easy elevation? Pomegranate seeds are a good one. It photographs really nicely! Add in some color: not only do fruits and veggies bring vibrance to a board, your guests will appreciate the vibrancy. Regional flavours should be reflected in the garnish! If I’m doing something a bit more Italian, I know that basil is going to complement the ingredients really well. Think about the shapes on your boards. For example, if you have a couple of round ramekins, fan some of your other ingredients in concentric patterns. Do you find a lot of crossover in your food styling and your entertaining styles? On set, food styling is so unreal. We’re using denture cream to make sure things stick to each other, or spraying things with olive oil to make it look super shiny and appealing. When I’m food styling for myself or for friends it’s really just taking an extra moment to look at the ingredients and make sure they look beautiful and appetizing. It’s considering the food as an artistic ingredient as opposed to just an ingredient. Take an extra moment to make sure that the product that you’re picking out is a beautiful complementary color, and that there are no bruises on it. Then just remember to enjoy yourself. Food is really just another way to hang out with your friends. Feeling empowered to build a beautiful charcuterie board this weekend? Take a scroll through Meg’s Instagram feed for some serious inspiration.